Many bloggers already know that Twitter is one of the best ways to drive traffic to your blog. When I talked to Guy Kawasaki about my book, he called the Tweetmeme Retweet button “the most important button on the web,” because of the enormous traffic-driving power it possesses. With one click, any of your readers can spread your post to hundreds or thousands of their followers. As a marketer, I, of course, see this as an opportunity for optimization. When I see a powerful tool, my first impulse is to figure out how to make it even more powerful. When you click that button, Tweetmeme grabs the title of the page it’s on, shortens the URL, and combines the two into a autofilled tweet for posting. Thus, the title of your post becomes the tweet that is shared with a potentially huge number of Twitter users. If the importance of compelling headlines wasn’t painfully obvious before, it should be now. 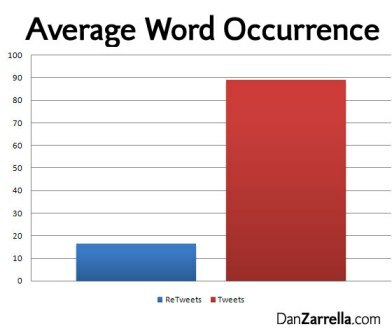 Nearly 20% of all “normal” tweets contain a link, yet almost 70% of retweets do. Retweeting is the most common way links are shared on Twitter. I’ve done research into various factors surrounding retweets and found a handful of factors that you may want to take into consideration when writing headlines for posts that you hope to share and spread on Twitter. 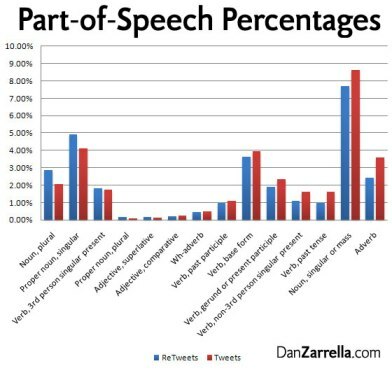 When I looked at the parts of speech that occur in retweets versus those that occur in normal tweets, I found that retweets tend to be noun-heavy and use third-person verbs. This pattern is reminiscent of newspaper headlines. Highly retweetable headlines talk about someone or something doing something. A headline should never talk about all the things you did yesterday and how you did them, as past-tense verbs and adverbs both lead to far fewer retweets. This means, whenever possible, you should talk directly to your readers. “Top” and “10” also rank highly, showing that lists do well on Twitter. Not surprisingly, talking about social media and Twitter itself also helps. On the other side of the coin are the least retweetable words. Random first-person verbs and details about your life, however fascinating you may find it, don’t get a ton of retweets. I compared how common words in retweets are to how often these same common words appear in normal tweets, and found that rare and more novel words are highly retweetable. When you’re writing your headlines, you should be striving to say something new that breaks through the clutter of everyday chatter. I expected to find that retweets were simple and required less intelligence to understand. But my data showed the opposite. 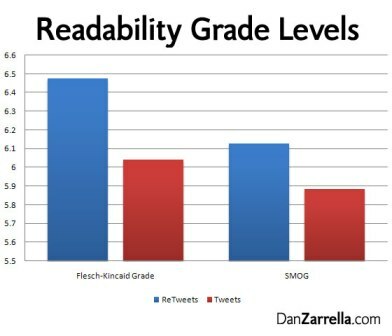 Using two readability metrics, I found that retweets often use longer, more complex words. So don’t try to “dumb down” your headlines for Twitter; users and power retweeters are smarter than you may think. LIWC is a linguistic system designed to identify concepts in pieces of text. 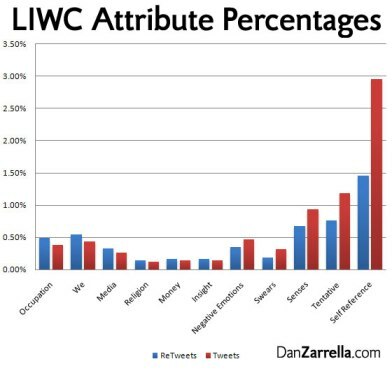 The most striking thing I found when using LIWC to analyze retweets is that self reference does not get a lot of sharing. In other words, don’t talk about yourself if you want Twitter traffic; talk about your readers. If you’ve been in social media awhile, you probably already guessed that was the case — now you’ve got the data to back it up. Previous article: Does Speech Recognition Software Really Work? Thanks Dan, Been wondering about this somewhat. It helps. I just did a new post about tweeting/not tweeting your link on twitter without some incentive in post etc. Thank you for sharing this data. I am using the twitter to gain traffic but I can’t maximize the use of it or I can’t make it as powerful as I want it to be. Hope your post can help me enhance my knowledge. I wonder if the data on this is influenced by the person doing the retweeting. If you have a strong relationship with your audience (or just a very large audience), I’d imagine you’d get a higher RT rate regardless of the words you use. That said, I’m glad you posted this, because it’s important to note that a number of the “most retweetable” words are calls to action (please help. please RT, check out, etc.). We should never underestimate the power of a good call to action – click here to learn why! Very informative article. I’ve been using twitter for awhile now and I used to just post my “daily thoughts” til I realized how big it’s potential for marketing. This article showed with data that it does work. Thanks for this post! Maybe you can post a trends & figures post in 6 months? I wonder how this will evolve over time. I guess the one exception to go viral would be confessions from “celebrities” (and maybe some lessons learned from it), but I couldn’t find these in the figures above. Interesting data. I see a lot of retweets that end in LOL. They always get my attention just because someone thinks it’s funny and I want to be humored also. So it is always a good way to go when writing a headline on twitter. However, I must humbly nitpick. The same advice for retweets applies to guest posts. In this post, you unwittingly used the word “I” 10 times and the word “my” 3 times (and threw in a book plug). This will certainly decrease your comment numbers. Senor Navarro that was funny :-p. This post has really got Dean’s mind racing. Dean thanks Dan for sharing his insight. That’s very interesting. And have you heard that ‘twitter’ is the top word of 2009? I don’t think this is surprising. I’ve heard about practically nothing else this year. Eventually I felt I had to join, but when I did I felt lost in cyberspace. This blogpost makes alot more sense of twitter. I shall bookmark it. I “spy” this blog for some time and like most of previous posts this is another useful material for me. I’m seeing social media related keyworks in 4 of the top 20. It’s just feeding my hunch that a lot of the buzz around Twitter is just backfeed from SM “experts” and “gurus”. Wow. This is great insight which learning copywriters can put to good use! I must say, Twitter is a great place to test headlines. As soon as I read the first paragraph I went straight away to install a TweetMe plugin on my blog. It is very interesting to see the parts of speech and their impact on RTs broken down the way you have it. I am surprised to see that the number 10 beat out How to. Hands down the most useful Twitter article I’ve read in a long time. These metrics are a great way to improve tweet responses! @Shane, I dunno, I use a lot of “I” in my posts too. 🙂 Depends on context. “I” can be good (if it’s in proportion) for relationship building. “You” is good for response. I wish you guys would use links that allowed for better posting. Your page link only gets you to copyblogger.com. Not great for Facebook sharing. Fascinating. You could use this post as a cheat sheet for writing eyeball hijacking headlines as well…. Good stuff. On another note – I will quibble a bit with the “Don’t be Dumb” conclusions. Is there something special about using tweetmeme, as opposed to some other form of retweeting? If so, I didn’t get it. Excellent material! It will be a great help in composing tweets that I want retweeted. It’s also interesting that the terms “please”, “retweet”, and “please retweet” are three of the Top-10 most frequent phrases. It would be good to know how frequently the term “please” is also followed by “RT” and “retweet” is preceeded by “pls”, thus making these all equivalent. The implicit conclusion one can also draw from that is that simply asking for something to be retweeted would seem to be VERY EFFECTIVE. Can this be confirmed? Amazing stats, thank you for sharing it and more importantly your analysis. What amazes me is that you can put phrases like “please retweet” etc. in the head line to improve results. Is this the SEO title that substitutes the actual title given? Great post, I really enjoy when you provide useful information that if implemented can really make a different on how we use the Marketing tools available…thanks and I have already tweaked my wording on my tweets, will let you how I make out. A really nice quantitative data analysis for twitter. Now at least everyone would know what really needs to be done to get twitter traffic. Thanks for sharing. Wow! This is some uber cool data! The most and least retweetable words are going to be super helpful, I’m sure of it. Dan, your info is very valuable to someone like myself who is in the infant stage of blogging (actually its more like pre-born stage.) At this point I can’t say that I really understand everything, but the more I read, the clearer it becomes. Thanks for sharing the research you’ve done. Thank you for your time and effort putting this data and post together. I sincerely hope you do a follow-up post to this one. Extremely helpful and it would be interesting to see how you did the actual research (did excel come into play?). Personally I find myself battling with headlines as I want to make them catchy, while at the same time not just a trickery to get people to read my blog. A good medium approach is most likely best there. Too often I click on catchy headline just to find that the headline has little or nothing to do with the content. Having your headline relevant must always be kept in mind as well – not just what will make people visit your side. Useful information. It isn’t too surprising, however, that “please retweet” and “new blog post” are included in the most retweeted words/phrases. There is yet to be a single site that aggregates and provides a method of measuring the success of all links spread on Twitter. Topsy and TweetMeme help, but don’t add too much insight. Sometimes there is just a little too much noise on Twitter to separate the good content from the headlines just re-used for clicks. Dan, great information. I had no idea how thorough some people have been with gathering Twitter data. I’m still not convinced as to the amount of time one needs to spend on Twitter to make it worth while, but this post gives me a little more hope. Great info here. It’s amazing what you can come up with and another lesson in the importance of getting the headline right! I guess they need to be short and snappy too. Thanks for the statistics Dan. Just goes to show the art of creating great headlines gets more and more valuable as social media expands into to new mediums. I love the Tweetmeme Retweet button. Just attended local Society for Technical Communicators meeting and the discussion was “Best Practices for Turning Web Content into Search Engine Snack Food”. We discussed the value of Twitter which many had yet to try. I plan to share this article with tonight’s group. Fascinating about using Please Retweet this in the headline. I’ll have to try it. Keep the valuable info coming. Very useful data, Dan. I liked the top retweeted words especially ‘you’, amazing how we can go wrong with word misuse. Thank you for presenting the graphs and stats; can’t beat that for good in-your-face facts. I must say I’m also surprised by the readability grade levels, did expect the opposite too; aren’t we always being told not to get too ‘complicated’ in what we say? Seems Twitter has its own rules. Thanks for taking the time to write this article. I enjoyed the graphs as well. Next time I have something extra special to say, I’ll add the please RT. I must watch the word I use in tweet now. I am a huge fan of Mr. Kawasaki. I’m glad to know that he highly approves the use of the tweetmeme button. And it is really convenient to use if you see something worth tweeting. Thanks for this information. Breaking it down linguistically will be a huge factor in helping me get my posts even more traction than I’m already getting. Never thought about looking at it from a linguistic point of view in my headlines. I’ve just always tried to write a unique (often humorous) headline to my posts. “Highly retweetable headlines talk about someone or something doing something.” That’s all I needed to know. Great insight, Dan. I agree with David – particularly like the top 10. V.Useful. However, as with most forms of marketing, I imagine (some) words that work now will be different to those that work in a year’s time or so. Words, like ideas, themes, tools, techniques even platforms, have a lifespan. It would be interesting to compare 12 months from now and see how many of these words are still on the list. The key is to identify the words that will attract people/get a response over the coming 12 months – before anyone else does. That said, words such as ‘free’, ‘great’ and ‘help’ will always elicit a response. It’s interesting to see the difference a few words can make and everyone should be taking care when posting. It’s obvious to talk about your readers rather than yourself when writing any content, but it’s so easy to forget with tweets especially if there are things you want to tell the world about. Great post with solid statistical data. This is specific and useful and applicable. Thanks. Dan, this is fascinating stuff. It goes to show you that no matter how interesting we think our life is, if it doesn’t build value in someone else’s, it just falls off their radar screen. Thanks so much for this information, After 12 years I have changed my career to work in social media and I truly appreciate this information! A follow up post about headline structure with examples and results to back this up would be good. I’d love to see some more of your research. Interesting that most of the least desirable RT words are passive, falling into what I would term a “low energy” category. Perhaps I’m reading the bar graph wrong, but doesn’t it show that self referential RTs score higher than the all the other concepts on the chart? I guess Twitter is fine and I can see it works – however I don’t have a twitter account (pre-blogging) and I’m really hesitant to start using it just because I have a blog. If I do set up a Twitter account, how do people even know I’m there to follow? I hope That someday the retweet button will hit the goldmine for me. So far it ain’t. Thanks for the advice. Will try this out! Might be but till now this has really not helped much to us.. Yeah we get traffic but not that much as we used to..